So I went to open the door the other day and heard what sounded like a spring pop loose. Not good, considering there is no other way to open the door. 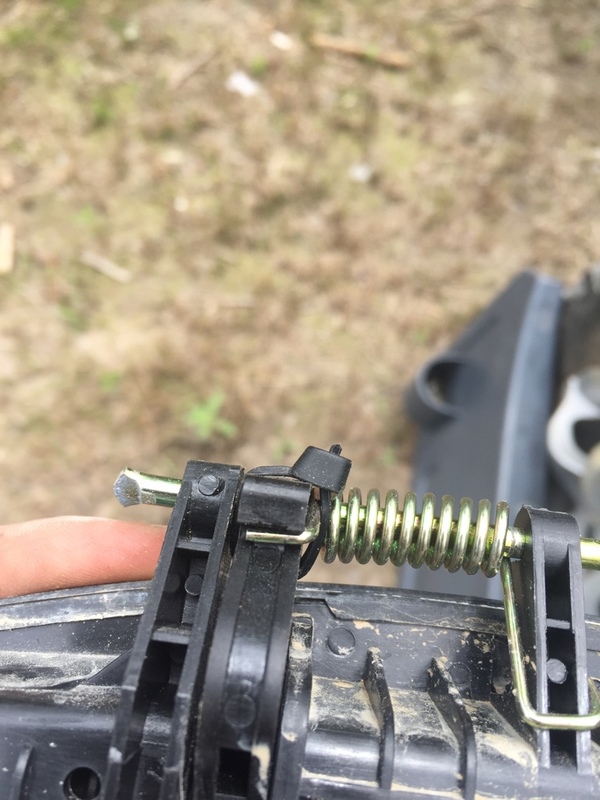 After finally getting the screws out of the door panel to where I could get the door open, I found the spring on the handle had popped loose. I hooked it back on but after a few pulls on the handle it popped off again. So I put a zip tie on it to hold it, went on and did the passenger side as well since the seat does not go forward which would make it almost impossible to get the screws out without pulling seat. Has any body else had this issue, and also how about inside handles? Anybody installed any? If so which ones, as in from what vehicle? You should have read the forum in Interior Mods and you would have found this subject has already been addressed and you could have picked up on some hints as to were to lube the door latches to prevent the handles for distorting and breaking. Also take notes on adjusting the little blue adjuster on the latch arm and how it takes out the play to keep the little rod from rattling around making noise from vibration. I do like you little idea of the strap-tie to keep the pivot rod from coming out. Usually this happens from not being able to push the little rod down because the whole latch mechanism is binding up and the rod will not push down so it breaks out so you can't open the door. Also we just did a coverage of inside door handles. My bad, I looked back some and saw where some people were having issues with the rod, but all that looked fine on mine. I did grease/Lube everything on both mechanisms.. Guess I will have to look further back and find the piece on the inner door handles. Try this it was just a couple of days ago in On Road Street Stuff.